Go back in time to the old west of the 1890's at Cody’s very own Old Trail Town. Here you will see some of the original buildings of the Big Horn Basin. The Cody Night Rodeo is one of the longest-running rodeos in the United States. It is open nightly from June 1-August 31. It’s really not an activity you’ll want to miss. Cody has some amazing trails for those who love to bike. In the last few years, the Park County Pedalers developed the Beck Lake Bike Trails right in Cody. Click here to find out where to access these trails. North Fork Anglers is a longstanding Cody business that provides valuable information about fishing in the area. They offer guide services and other great products for anglers of all abilities. The Paul Stock Aquatic and Recreation Center is the ideal place for people to swim, lift weights, play a round of basketball or racquetball, and more. Visit Wyoming Trout Guides to gear up for a day of fishing in the amazing waters of Cody. They offer guide services, great advice on the flies that are biting, and places to fish. Olive Glenn Golf and Country Club is located in Cody and has a vast 18-hole golf course, driving range, and putting green. It also has incredible food at their restaurant. This is the place to come to beat the traffic of downtown. 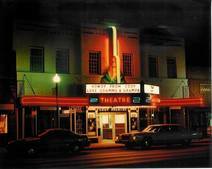 Recently digitized, the Cody Theater reopened to theater goers after many years. While it's not the only movie theater in town, it definitely has the most history. Movies change frequently, so check their website often! Painted more than 50 years ago by Edward T. Grigware, the Cody Murals depict the history of the westward expansion and the settling of the Big Horn Basin. Recently renovated, this is not an exhibit to miss.